Ratan Tata has received a farewell gift of sorts he had hoped for. His dream car, Tata Nano has managed to reach the top 10 best-selling cars in India for 2012, ahead of Tata’s first car, the Indica. Tata motors registered a sales figures of 74,545 in the calendar period ending November 2012 which means that the Nano’s sales grew by 18 percent in the same period last year. This comes as a remarkable improvement seeing that the petrol cars have noticed a slowdown. 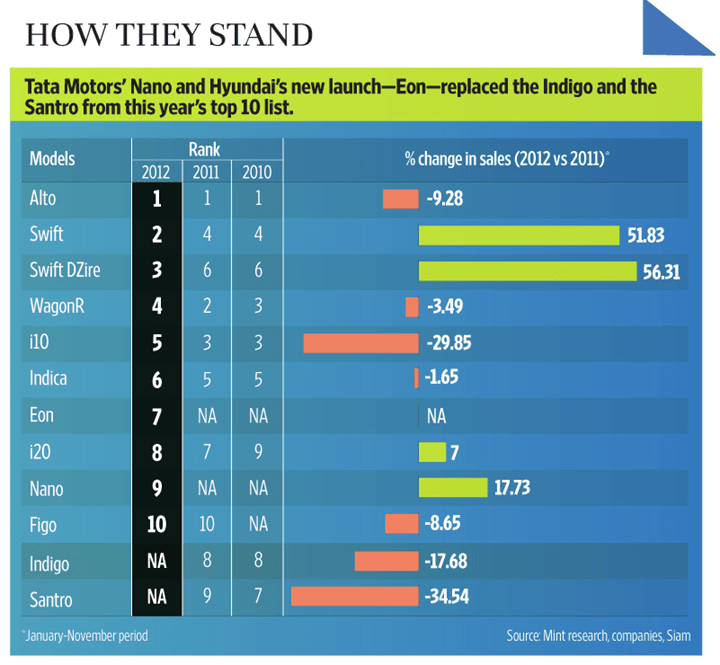 Maruti Suzuki continued to dominate the top 10 by bagging the top 4 positions. As a matter of fact, even though they’ve managed to stay on top, the likes of the Alto, i10 and Wagon-R have instead registered a decline their sales over January-November 2011 and the Tata Nano has registered an increase in the sales at a time when the difference between the petrol prices and diesel prices has widened with the petrol rates reaching new heights. Nano continues to be touted as the country’s most efficient petrol hatchback. 58 percent of the cars sold in January-November 2012 ran on diesel which is subsidized by the government meaning that 6 out of every 10 cars sold ran on diesel. This number further increases when we go to upper car segments. 9 out of 10 luxury cars sold have a diesel heart. Tata Nano is out and out a petrol car but Tata is soon going to bring in CNG and Diesel variants of the Nano to take advantage of the price difference between diesel and petrol. Tata motors repositioned their Nano in late 2011 after there were instances of Nano catching fire. They reworked the Nano’s underpinnings and a successful advertisement campaign saw an increase in sales. By introducing new variants, features and colours Tata looked to improve the aspirational value of the car which had become that of a poor man’s car. And it pretty much paid off. Nano was not even amongst the top 10 in 2010 and 2011 and it has come straightaway to the 9th spot. Expect it to go further up with the Nano diesel and someday it might be the car Ratan Tata wanted it to be. Farewell, Mr. Ratan Tata.